The What's Next series is part of an ongoing look from the Pens Initiative staff taking a look at the Penguins UFAs, RFAs, and most polarizing personalities heading into the next season. We look at the year that was and the year coming and wonder: What's Next? Matt Cooke, NHL public enemy number one, is an unrestricted free-agent now that the 2012-2013 season is over. Cooke has been one of the controversial figures in the entire league during his career and that has been highlighted during his duration with the Pittsburgh Penguins. Despite the controversy and dumb mistakes by Cooke, he has been an instrumental role player for the Pens and I think they should do whatever it takes to re-sign him. So what's next for Cooke? Cooke, 34, is heading towards the end of his career, but is still an effective checking forward in this league. Cooke was amazing in this postseason for a third-liner that gets criticized more often than not. Cooke was only on the ice for 9 total goals against during the playoffs, with just seven of those coming via even strength. That's even more impressive considering that Cooke started in the defensive zone over 70% of the time. Cooke is the ideal role player for the Pens. He's gritty, plays solid two-way hockey, and gives non-stop effort. Even during the games that the Penguin's had their effort questioned and criticized in, Cooke's effort never was. Cooke made plays on the offensive side as well, especially the epic assist he had on the short-handed goal scored by Pascal Dupuis. Cooke has been well worth his $1.8 million per-year salary in Pittsburgh. In five years, Cooke has averaged 13 goals and 30 points per season with the Pens. That's pretty good for a third-line goon if you ask me Eugene Melynk. Of course, having Cooke on your team has some major negatives. From a PR standpoint, the Pens are under constant attack for having Cooke on their team. Eugene Melynk, the owner of the Ottawa Senators said that Cooke should be banned from the NHL after Cooke accidentally injured Erik Karlsson's achilles by stepping on it. Senators' fans actually held a Matt Cooke "Hatefest" pep rally to show how much they dislike Cooke. Follow that up with Jack Edwards, who is a play-by-play announcer for the Boston Bruins, comparing Cooke to Sirhan Sirhan, the guy that assassinated Robert Kennedy. This came from the Penguins nominating Cooke for the Masterson award in 2012 for sportsmanship. Of course there is inrony in that, but it's hard to compare a semi-dirty hockey player to an assassin. Cooke is the guy who Bruins fans blame for Marc Savard's career being over. It didn't stop there either. Cooke was given a game-misconduct in game two of the eastern conference finals for hitting Bruin's defenseman Adam McQuaid from behind. This is what you have to put up with if Cooke is on your team. Luckily, perception isn't reality. Having watched Cooke play the entire time he's been in Pittsburgh, I can say for sure that Cooke has tried his best to change into a better player and person. The residents of Pittsburgh say nothing but good things about Cooke, who is a avid church giver and humanitarian. On the ice, I think Cooke is vastly underrated. Not only has Cooke cleaned up his play over the last two seasons, but he's continued to grow as a player. I certainly think he doesn't get enough credit for how truly skilled he really is. Factor in his effort, defensive play, and the fact that he's not going to cost too much money, I think Cooke would be a great signing for any team in the league. But will that team be the Pittsburgh Penguins? Josh Yohe, from the Tribune-Review, went on to say that Cooke's age and increase in salary are going to be the main reasons for his likely departure. Again, I think it would be a mistake to let Cooke go. Cooke can play in any system and pretty much any line, with the exception of the top line. Tanner Glass, who is signed for next season at $1.1 million, is not going to bring what Cooke can bring. I would use a buyout clause on Glass to secure Cooke for at least two more years, even if the price is over $2 million per-year. Cooke's antics have decreased the last two years, and despite being skating around with a target on his back, Cooke has actually become very good at drawing penalties. Drawing penalties takes skill, especially when you're Matt Cooke, but somehow Cooke tied Evgeni Malkin in the 2012-2013 postseason with 2.2 penalties drawn per-game to lead the team. That's incredible for a guy that usually gets the most penalty for any situation. Reality is, Cooke is the perfect checking forward, especially for a team that is competing for a Stanley Cup. However, the Penguins are trying to get younger, especially at the forward position. Cooke is 34, and the Pens will most likely look to re-sign Pascal Dupuis before they get to Cooke. As understandable as that is, I think the Pens should use whatever money they have left from re-signing Dupuis, Kris Letang, and Malkin. Matt Niskanen is due $2.3 million next year and was brutal in the postseason. If I"m Ray Shero I'm looking to move or even buyout Niskanen to help secure Cooke along with Dupuis, Letang, and Malkin. 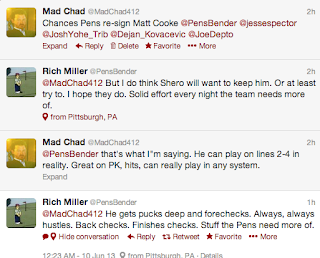 Sadly, from talking to some people who actually get paid to cover the NHL, it seems unlikely that Cooke will be back. Again, I think that's a mistake but what can you do. Cooke deserves a raise and some people have said that he wants a three-year contract. I don't know about the rest of Pens fans, but I certainly do not look forward to actually having to face Cooke, and then have to hate him when he nearly kills Paul Martin during a game. 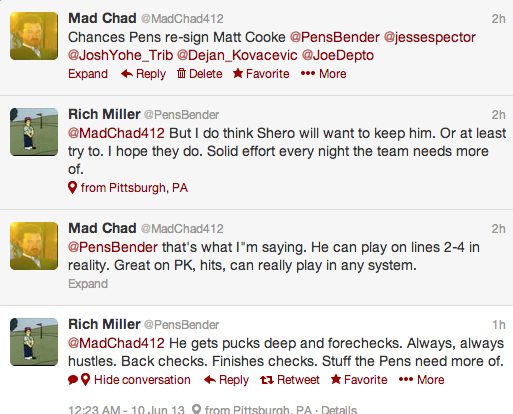 Bottom line: I think most Pens fans want Cooke back but I doubt he will be.